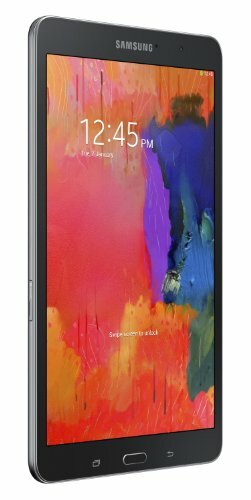 Samsung Galaxy Tab Pro 8.4 is an impressive Android tablet released some years ago, in 2014, featuring an extremely fast Quad-Core processor speeding at 2.3 gigahertz, a 8.4" multi-touch screen, an 8 MP back-facing camera and a 2 MP front camera. 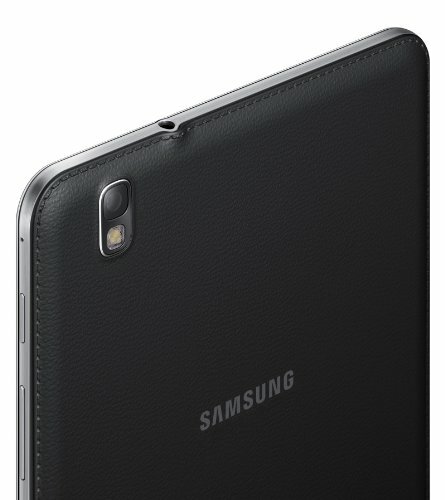 Samsung has made a very nice job making the Samsung Galaxy Tab Pro 8.4 as lightweight as 11.68 oz. Being just 0.28 inches thick,this tablet is very thin and practical. The Tab Pro 8.4 is just 8.62 inches long and 5.06 inches wide, but it still manages to hold a 8.4" display. Samsung packed this device with a completely amazing 8.4" screen, and a resolution of 2560 x 1600 , giving this tablet a very detailed graphic quality. Its screen uses Super Clear LCD capacitive technology, and has multi-touch detection. Samsung decided to design the Tab Pro 8.4 using a high-tech 2300 MHz Quad-Core CPU, bundled in the Qualcomm Snapdragon 800 MSM8974 system chip with a big 2 GB of RAM memory. Graphic calculations often consume lots of processor cycles, so the Tab Pro 8.4 also has an Adreno 330 GPU clocking at 450 MHz to improve overall performance. 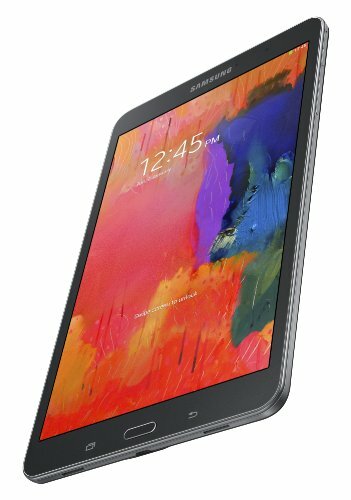 A good advantage of the Samsung Galaxy Tab Pro 8.4 is its 16 GB quite big internal storage memory and an external memory slot, which allows you to install hundreds of apps and games without any trouble. This device features two cameras, an 8 MP back camera and a 2 MP front facing camera. The Samsung Galaxy Tab Pro 8.4 can also capture Full HD 1920x1080 videos at 60 fps. Additionally, the camera includes a lot of useful characteristics: flash, auto-focus, face detection shooting, smile detection shooting, geo tagging and HDR mode. 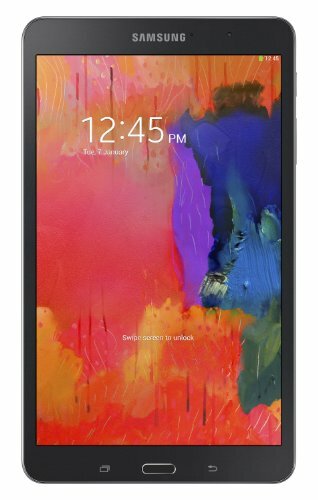 This device has an incredible 4800 mAh non-replaceable battery, enough to provide the Samsung Galaxy Tab Pro 8.4 with an incredible battery life. An issue to consider is that the Tab Pro 8.4's battery isn't removable	so you can't change it when it begins to lose its charge, whereas with such a huge battery size you will probably replace this tablet before it becomes an issue. The Tab Pro 8.4 includes wi-fi capability (which it can provide to other devices around, as a mobile hotspot), LTE (4G) fast data connection and also HSPA+ connectivity, that is a lower speed 4G network or 3G fast connection type, over HSDPA, HSUPA and EDGE technologies. 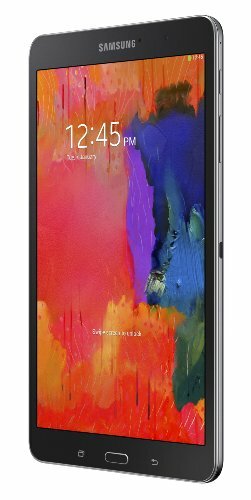 The Samsung Galaxy Tab Pro 8.4 works with a SIM card for GSM services. This tablet also comes with many interesting features like Bluetooth (provides communication with other devices, computers and accessories), GPS Localization, Infrared Port and NFC (Near Field Communication), and multiple sensors like Light Sensor, Accelerometer, Gyroscope and Compass. Samsung is selling this device for around 779 dollars, which is quite close to other similar devices. The Tab Pro 8.4 is definitely the correct option for you no matter if you are a photography fan, need a tablet majorly for internet broswing and social networks, want a device to play tons of games or need a tablet for work.